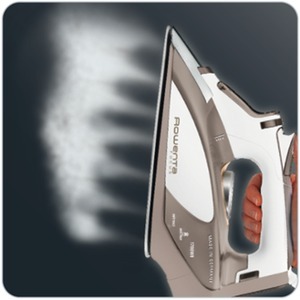 DW5080 Steam Burst and Vertical Steam, 400 Steam Holes in Stainless Steel Soleplate, Soft Handle, 10oz Water Tank, Self Cleaning, Rounded Back Soleplate. An innovative design with polished stainless steel soleplate and rounded back delivers unrivaled ironing performance that moves back and forth without getting stuck on creases. The new DW5080 Focus provides the optimal balance between breakthrough technology and advanced design. The striking European design reinforces the features and performance of the new Focus, which combine with an improved thermostat knob and transparent water tank for absolute ironing confidence. The highly polished stainless steel Microsteam 400 soleplate with the unique high precision tip deliver unsurpassed ironing performance in even the hardest to reach areas. Micro steam 400 soleplate technology. 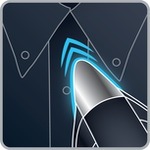 High precision profiled tip for perfect ironing results. 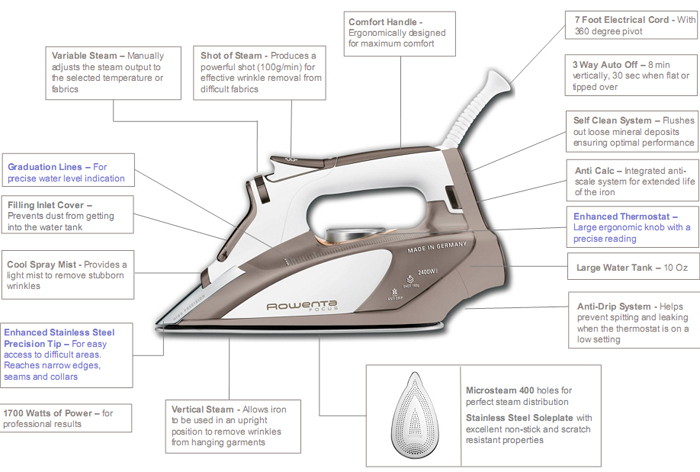 Allows easy access to difficult areas such as narrow edges, seams and collars for excellent detailed ironing. 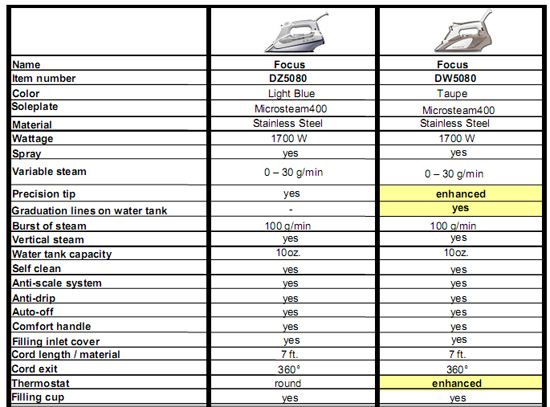 HIGH PRECISION TIP ON THE SOLEPLATE High precision profiled tip for perfect ironing results. 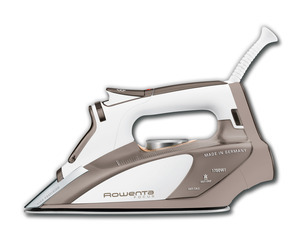 Allows easy access to difficult areas such as narrow edges, seams and collars for excellent detailed ironing. 400 MICROHOLES STAINLESS STEEL SOLEPLATE Unique patented Microsteam soleplate technology with 400 microholes for perfect steam distribution and smooth glide across the fabric. 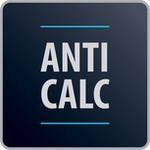 ANTI-CALC TECHNOLOGY The integrated anti calc prevents scale from aggregating into the iron due to hard water and maintain long-lasting clean steam output. SAFETY AUTO-OFF. 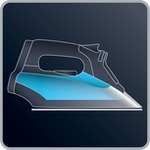 The iron is automatically put on standby mode when left unattended: after 8 minutes when left on its heel, and after 30 seconds when left resting on its soleplate or side. It prevents energy waste and risk of burning. 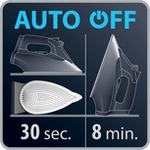 3 WAY SMART AUTO SHUT OFF For safety and peace of mind, the iron shuts off automatically after 8 minutes if left unused in the upright position and after 30 seconds if left in the horizontal position or tipped over. 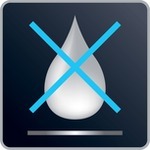 EXTRA LARGE WATER TANK - TO REDUCE RE-FILLS 10 Oz. water tank to reduce the number of re-fills required. As an Army Combat Nurse, it is very important for me to present myself in a professional way. The military uniforms I wear must be starched and ironed to the finest specifications as I am constantly being inspected in formation and on the job. The Rowenda iron purchased from you has proved to be an outstanding product when it comes to preparing my military uniforms for the task ahead. Thank you for such fine service and product. The product was exactly what I wanted. The price was good and I love the free shipping. 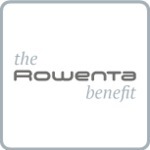 I recently purchased a Rowenta Iron from your company and would just like to thank all of you for making this such an easy experience. I had never heard of you company until I started to compare prices on my iron and Allbrands came up. I will continue to go to Allbrands first to make my purchase. Thank you again for being so easy and dependable. Was surpised how fast it came!!!! I really like your website and will tell others about it! After this purchase I'll be checking allbrands.com web more often.